Oral Presentations. The Behaviour of Proteins at Interfaces in Relation to their Structural Stability (W. Norde). Influence of the Solvent Properties on Protein Stability in Organic Media (E. Battistel, D. Bianchi). Interfacial Damage to Proteins during Intensive Mixing in Fermentation and Downstream Processing (M. Hoare, M.R. Khan, P. Dunnill). Thermal Stability of Enzymes: Influence of Solvatation Medium (A Raman Spectroscopy Study) (D. Combes, I. Auzanneau, A. Zwick). Protein Stability in Non-Aqueous Media: A DSC Study (G. Barone et al.). Stable Enzymes by Water Removal (F. Franks, R.H.M. Hatley). Enzyme Stabilization by Multipoint Covalent Attachment to Activated Pre-Existing Supports (J.M. Guisán, et al.). Crosslinked Enzyme Crystals (CLECs) as Immobilized Enzyme Particles (M.A. Navia, N.L. St. Clair, J.P. Griffiths). Stabilization of Proteins by Chemical Methods (V.V. Mozhaev). Stability of Engineered Antibody Fragments (A. Plückthun). Structural Determinants of the Thermostability of Thermolysis-Like Bacillus Neutral Proteases (V.G.H. Eysink et al.). Molecular Aspects of Proteolysis of Globular Proteins (A. Fontana, P. Polverino de Laureto, V. De Filippis). Stability of Industrial Enzymes (O. Misset). Stabilization of the Detergent Protease Savinase by Proline Substitution (C. van der Osten et al.). Lessons from Industry (K. Sauber). Stabilization of Enzymes by their Specific Antibodies (E.Y. Shami et al.). Posters. (46 Papers). Author Index. 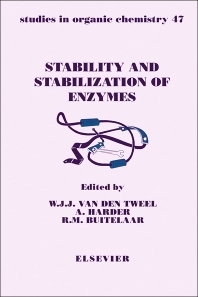 These proceedings contain most of the oral presentations and posters of the international symposium on Stability and Stabilization of Enzymes held in Maastricht in November 1992. They provide a comprehensive overview of the state-of-the-art in this field. The possible applications of enzymes are enormous. Years of development have seen many enzymes brought onto the market, but they are still expensive to use. Therefore, their efficient application is a prerequisite for common usage. One of the main factors for this efficiency is the stability of the enzymes. The topics thus ranged from the extensive fundamental thermodynamic knowledge gathered in academic research to the practical applied knowledge built up in industry during the time that enzymes have been produced commercially. The subject Stability and Stabilization of Enzymes was discussed from various points of view, as was reflected in the themes of the symposium sessions. In the session on Fundamentals of Enzyme Stabilisation the thermodynamic background of the phenomenon was highlighted. In yet another session, the recently developed analytical tools to measure enzyme stability and stabilisation were discussed. Further sessions comprised the physical, chemical and biological ways to obtain enzyme stabilisation and finally, the industrial practice of enzyme stabilisation was treated by representatives of the world's most important enzyme producers. The book will be of interest to researchers in universities and industry in the fields of biochemistry, enzymology and biotechnology.